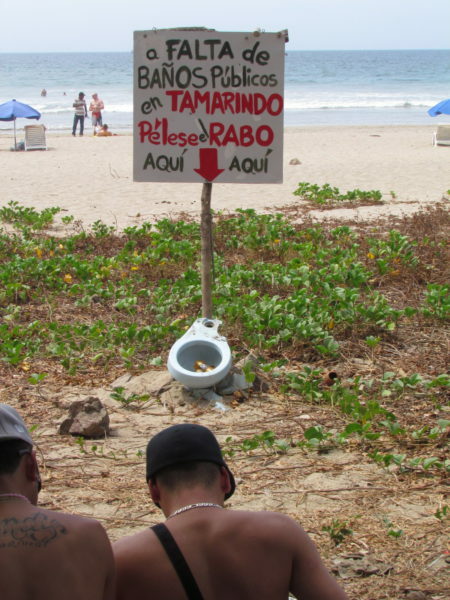 It used to be very difficult indeed to find a public restroom in Costa Rica. 25 years ago your best bet was a bar where you’d likely find only a gent’s and it was often nothing more than an outside wall with a drain hole at one end. The advent of fast food restaurants, modern supermarkets and shopping malls have made urinating en plein air a thing of the past… for most part. Service stations also have restrooms now but as in most countries the cleanliness can be pretty abysmal in some. You’re better off heading to one of the three places mentioned above (in the order mentioned) if you have an urgent need. One place that public restrooms are still nearly non-existent are on the beaches so either spring for a $500 a night ocean front bungalow or plan around it. There are a (very) few beaches where pay per use facilities are popping up. It used to be common to have a small charge to use restrooms everywhere but now it’s relegated to the playa. Most beach bathrooms also offer separate showers. It’s common to have a shared sink on the wall outside of public men’s and lady’s rooms so if you choose not to wash up everyone will know about it. Except in the modern buildings mentioned above it’s also fairly common for men’s rooms to have only a urinal so if you need more you should take care of it before you head to the restaurant or face the embarrassment of sneaking into the ladies…and perhaps the more awkward moment when you try to sneak out and there are a couple of gals waiting in line (remember there’s probably no vent fan…).